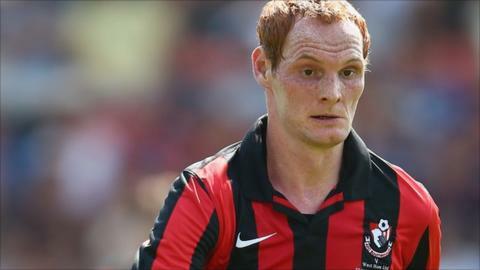 Bournemouth midfielder Shaun MacDonald says he is happy to stay and fight for his place in the Cherries team. The Wales international still has two years to run on his contract at Dean Court, but was restricted to just 11 league starts this season. He fell behind Harry Arter, Eunan O'Kane and Andrew Surman in the midfield pecking order. "I love it here, I'm not looking to leave," 25-year-old MacDonald told BBC Radio Solent. MacDonald began his career at Swansea, but had four loan spells at Yeovil before joining the Cherries in August 2011. And he is determined to force is way back into manager Eddie Howe's plans for next season. "I've got my head down and I've kept working hard," he said. "I love this club and I love the philosophy of how they play, that's why I came here. "It's one of those where every footballer wants to play football and I'll come back in pre-season and work hard and go from there."